^ 1.0 1.1 1.2 A. S. Tanenbaum. LINUX is obsolete. Newsgroup: comp.os.minix. January 29, 1992 [2015-06-02]. 12595@star.cs.vu.nl. ^ What would you like to see most in minix?. 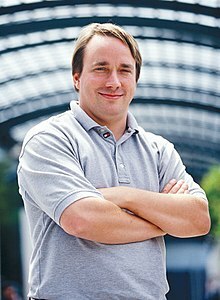 Linus Benedict Torvalds. 1991-08-26 [2010-12-21]. ^ L. Torvalds. Re: LINUX is obsolete. Newsgroup: comp.os.minix. January 29, 1992 [2015-06-02]. Usenet: 1992Jan29.231426.20469@klaava.Helsinki.FI. ^ 7.0 7.1 A. S. Tanenbaum. LINUX is obsolete. Newsgroup: comp.os.minix. January 30, 1992 [2015-06-02]. Usenet: 12615@star.cs.vu.nl. ^ Kevin Brown. RE: LINUX is obsolete. Newsgroup: comp.os.minix. January 31, 1992 [2007-04-07]. Usenet: 1992Jan31.074347.1198@menudo.uh.edu. ^ L. Torvalds. Apologies (was Re: LINUX is obsolete). Newsgroup: comp.os.minix. January 30, 1992 [2007-01-10]. Usenet: 1992Jan30.153816.1901@klaava.Helsinki.FI. ^ Theodore Y. Ts'o. Re: LINUX is obsolete. Newsgroup: comp.os.minix. January 31, 1992 [2007-05-11]. Usenet: TYTSO.92Jan31164013@SOS.mit.edu. ^ Tanenbaum, Andrew S. Some Notes on the "Who wrote Linux" Kerfuffle, Release 1.5. [2008-05-21]. （原始内容存档于2010-09-11）. ^ Tanenbaum, Andrew S. Ken Brown's Motivation. [2007-12-24]. ^ Tanenbaum, A. S. Can We Make Operating Systems Reliable and Secure? (PDF). IEEE Computer Society. May 2006, 39 (5): 44–51 [2015-06-02]. doi:10.1109/MC.2006.156. ^ Tanenbaum, A. S. Tanenbaum-Torvalds Debate: Part II. Vrije Universiteit Amsterdam. May 2006 [2007-01-14]. ^ "bariswheel", "Hemos" & Slashdot contributors. Microkernel: The Comeback?. Slashdot. May 2006 [2007-01-14]. ^ Torvalds, L. Hybrid kernel, not NT. Real World Technologies. May 2006 [2015-06-02]. ^ diegocgteleline.es, ScuttleMonkey & Slashdot contributors. Torvalds on the Microkernel Debate. Slashdot. May 10, 2006 [2015-06-02].